During the seventeenth century, the Brahui rose to prominence in Kalat, in Baluchistan.. For the next 300 years there was an unbroken line of Brahui rulers. The British eventually acquired control over the strategically located Kalat, although the state remained independent until it was incorporated into Pakistan in 1948. Estimates of the Brahui population vary from 861,000 to over 1.5 million. Most of this number is concentrated in Pakistan’s Baluchistan Province around the town of Kalat. Brahui-speakers are also found in southern Afghanistan and Iran. The Brahui homeland lies on the Kalat Plateau, where elevations vary between 7,000–8,000 feet (2,100–2,400 meters). The region is extremely arid (dry), with annual rainfall averaging less than eight inches (twenty centimeters). Strong northwesterly winds prevail through the area, bringing dust from the Iranian deserts and scorching temperatures in summer, and bitter cold in winter. The plateau consists of extensive areas of barren rock, or hills with a thin cover of drought-resistant vegetation. The Brahui language is related to the languages spoken in South India. This language similarilty to people living almost 1,000 miles (1,600 kilometers) away has long puzzled South Asian linguists (people who study language). There is no Brahui script. Many Brahui-speakers are bilingual, speaking Baluchi or other local languages. A Brahui story tells of Mulla Mansur, an orphan who got a job in the house of a qadi (a Muslim religious leader). The qadi was an insensitive man. Even though Mansur had served him loyally for seven long years, he beat him over a trifling mistake. Mansur left the qadi and took to traveling the world. He met an old shepherd, fell in love with his daughter, and married her. When Mansur and his wife returned to his home, the beauty of his wife caused such a stir that everyone from the qadi to the king desired to possess her. However, Mansur’s wife was steadfast in her fidelity to her husband. When the qadi continued to make advances and tried to seduce her, she exposed him publicly. All the people joined in condemning the qadi, and the king banished him from the Brahui lands. This tale presents the Brahui view of the qualities and strength of character desirable in a wife, as well an element of scepticism toward religious leaders who preach purity to the world but practice otherwise. The Brahui are Muslim, belonging mostly to the Sunni sect of Islam. They follow Islamic religious beliefs and practices as set out in the Qu’ran (Koran), though many of their social customs are Indian in origin. Communal worship focuses on the mosque, and mullahs (Muslim priests) see to the spiritual and ritual needs of the people. Reverence for saints (pirs) is also deeply entrenched in Brahui culture. Every family has its particular saint, and women often keep in their houses some earth (khwarda) from the saint’s shrine to be used in time of need. The Brahui believe in sorcery and possession by jinn or evil spirits. A mullah or sayyed (holy man) is often called in to read from the Qu’ran or provide charms and amulets to exorcise these spirits. Should this fail, a sheikh, who is known for his power over jinn may cast them out by dancing. The Brahui observe the usual holy days of the Muslim calendar. The holiest of all is the eve of the tenth day of the month of Muharram, which is known as Imamak . Women prepare special dishes of meat and rice during the day. The family gathers near sunset in the presence of a mullah (Muslim priest), who reads from the Qu’ran and recites prayers for the dead over the food. Dishes of food are then sent to relatives and neighbors, who reciprocate with their own offerings. The following morning is an occasion for the head of the house to visit the graveyard to pray at the graves of his dead relatives. The birth of a son is of utmost importance for a Brahui. A daughter is seen as little more than a gift to one’s neighbor. When a son is born, the father announces it to the community by firing gunshots in the air. Various rituals are followed to protect the mother and child from the attention of witches and jinn (evil spirits). Sheep are killed (two for a son and one for a daughter) and a feast held for relatives, friends, and neighbors. The child is then named, sometimes after a worthy ancestor. The head-shaving ritual (sar-kuti) is performed by the time the child is two years old, often at the shrine of a favored saint. A male child may undergo circumcision (sunnat) within six months, though the cost associated with the celebrations cause many to postpone it until as late as the age of ten or twelve. No particular ceremonies accompany the male reaching puberty. An unusual rite is reported to be followed when a girl begins to menstruate for the first time. At sunset, the mother arranges three stones in a triangular pattern on the ground and has her daughter leap over them three times. It is thought that this will ensure that the girl’s periods during the rest of her life will last no more than three days. If a girl were not married as a child, she would be soon after puberty. At death, word is sent to relatives and friends, who gather for the funeral. A shroud is sent for from outside the house, and when the mullah (Muslim priest) arrives, the body is carried to a place of washing. It is washed by the mullah and near kinsmen (or the mullah’s wife and female relatives, in the case of a woman), then wrapped in the shroud. The body is taken in procession to the graveyard, with the mourners reciting the kalima, the profession of faith. At the graveside, the mullah offers the prayer for the dead, and the body is given its burial. Other rituals include the singing of dirges (moda), and a death feast (varagh). Another feast is held on the first anniversary of the death. On meeting, the Brahui stop, shake hands, and embrace each other. The encounter continues with inquiries after each other’s health and then proceeds to an exchange of news (hal) concerning family, friends, cattle, and other matters of interest. Brahui are known for their hospitality to their guests. Brahui settlements essentially reflect the economic activities of their inhabitants. Pastoral nomadism was the traditional occupation of many Brahui: nomadic herders lived in tents and temporary camps, migrating with their herds in search of pasture. Pastoralism has declined in importance in recent years. Many Brahui have adopted a way of life based on a seasonal migration to differing elevations. Villages in the highlands suitable for cultivation are occupied for nine-month growing season. During the winter months, these Brahui drive their herds to the lowlands where they live in tent camps. The Brahui are organized into tribes, each of which has a hereditary chief (sadar). The tribes are loosely structured units based on patrilineal descent (tracing descent through the father) and political allegiance. This clan system allows for Baluchi and Pathan groups to be incorporated into the Brahui tribal units. Some of the largest Brahui tribes are the Mengals, Zahris, and Muhammad Hosanis. The favored marriage among the Brahui is with the father’s brother’s daughter. Marriages are arranged, although the wishes of the couple are taken into consideration. In the past, child marriage was common, though this practice is now banned under Pakistani law. The betrothal and marriage ceremonies are important events in the life of both family and tribe. Disputes within tribes are usually settled at the time of marriages. A bride price (lab) is paid by the groom’s family. Although Muslim law allows polygyny (multiple wives), economic realities mean most Brahui marriages are monogamous. Family structure tends to reflect economic systems. The nuclear family predominates among nomadic Brahui, while extended families are common among village inhabitants. Divorce, though simple, is rare. In the past, adultery was punishable by death, although such practices are forbidden by Pakistani law. Widow remarriage is accepted. A young boy is given his first trousers at about three years of age, and thereafter wears clothes similar to those of adult males—the kurti (long shirt), worn over the salwar, the loose, baggy trousers found throughout the area. For men, a turban (pag) completes the outfit. Women wear a long shift over trousers, although among Brahui nomads women wear skirts rather than trousers. Among the Brahui of the Jhalawan region, women’s shifts are typically black in color. Women’s clothes are embroidered with various patterns and designs in colored thread. Women’s ornaments include finger rings (challav), nose rings (vat), and earrings (panara). Brahui settled in the Sind region tend to dress like the Sindhi population. The settled Brahui cultivate wheat and millet, which are ground into flour and baked into unleavened breads. Rice is also eaten, but usually only on special occasions. Mutton and goat are important in the diet of the Brahui. The more-affluent farmers in lowland areas may raise cattle. As is common throughout South Asia, food is eaten with one’s hands, and often from a communal platter. Milk is drunk and also made into curds, ghi (clarified butter), buttermilk, and butter. Dates, wild fruits, and vegetables are also part of the Brahui diet. Tea is drunk at meals and is also taken as part of various social ceremonies. Levels of literacy (the ability to read and write) among the Brahui are extremely low. The 1972 census for the Kalat Division of Baluchistan Province recorded an overall literacy rate of only 6 percent in the population over ten years of age. The Brahui live in areas of Pakistan where there is no access to formal schooling, and even where schools do exist, attendance is low. In settled areas such as the Sind region where Brahui children are more likely to attend school, they are taught in the local language rather than in Brahui. The Brahuis have an oral tradition of folk songs and heroic poems. These are sung by a class of professional minstrels and musicians called Dombs, who are attached to every Brahui community. Musical instruments include the rabab (an Afghan stringed instrument plucked with a piece of wood), the siroz (a stringed instrument played with a bow), and the punzik (a reed instrument). These have replaced the dambura (a three-stringed instrument played with the fingers) which is found in the more isolated areas. Dancing is an important feature at events such as weddings and funerals. Historically, the Brahui were pastoral nomads, migrating with their herds of sheep, goats, and cattle from the upland plateaus to the low-lying plains. Today, however, many Brahui have abandoned their pastoral activities in favor of transhumant (seasonal migration between lower and higher elevations) or settled agriculture. In the Kacchi lowlands, river and canal irrigation support cultivation, but settlements in other areas of the Brahui region depend on qanat irrigation, a system of tunnels dug between shafts to carry water. Horse-racing and target-shooting were traditional sports popular among the more affluent sections of the Brahui community. In the past, the Brahui had to depend on their own resources for entertainment and recreation. They found this in their family celebrations, their traditions of folk song and dance, and in the festivities accompanying religious observances. This is still true for nomadic Brahui today. Those settled in Karachi or villages on the plains have access to more modern forms of recreation. Brahui women embroider their garments with colorful designs. Tents and rugs are made from sheep’s wool or goats’ hair. The Brahui tribes inhabit some of the harshest, most-isolated, and least-productive environments in Pakistan. This is reflected in the relative inefficiency of traditional economic systems and the generally low standards of living of the community. Belated government efforts to bring development to the region have done little for the welfare of the Brahui, who are essentially nomadic and rural in character. The Brahui are one of the many tribal minorities in a country dominated by ethnic elites such as the Punjabis and Sindhis. The lack of a written literature (what there is dates only from the 1960s) has hindered the development of a tribal consciousness, and matters are made worse by the declining numbers of people speaking Brahui. 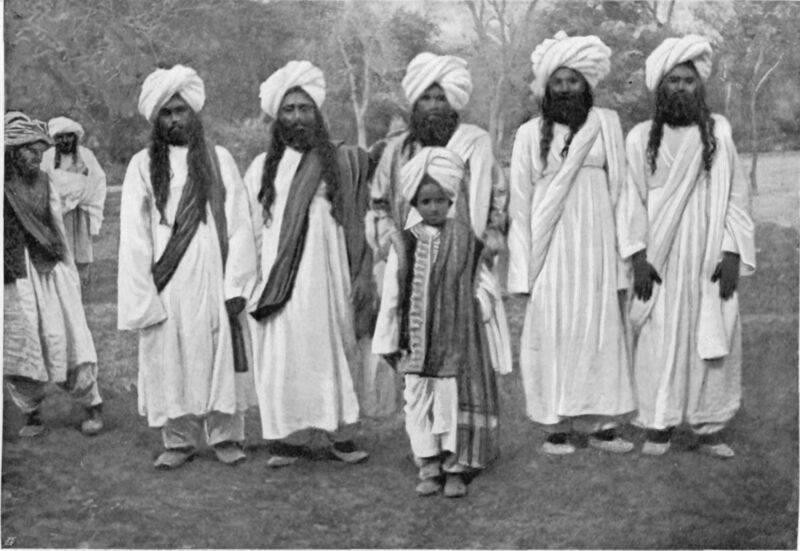 The Brahui appear to be rapidly assimilating with the surrounding Baluchi populations.